The Wigwam Murder is the murder of a woman named Joan Wolfe in Surrey, England by August Sangret, a French-Canadian soldier. 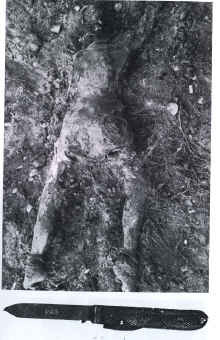 On October 7, 1942, two soldiers noticed an arm protruding from a mound of earth, belonging to Wolfe. Beside Wolfe, was a letter to Sangret telling him that she was pregnant. Wolfe had been stabbed with a hook-tipped knife and killed with a blunt object. Sangret’s battledress was found to have bloodstains, and the knife was found blocking a waste pipe, so Sangret was found guilty of murder, and hung on April 29, 1943.